Any release of Operating Systems (OS) like Windows, OSX, UNIX-based, etc. In this forum you can post official OS or modified releases (homemade for example). 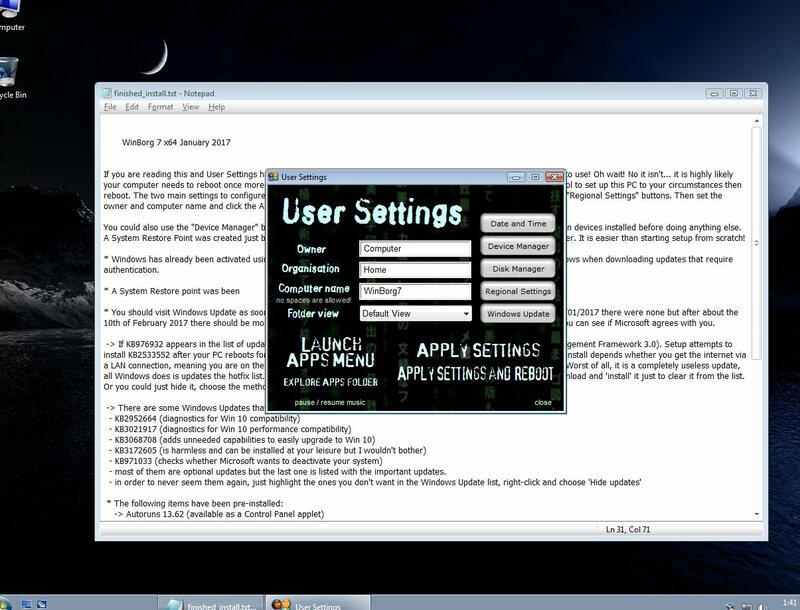 If you boot with this DVD and start the setup routine, this will clean install a 64 bit version of Windows 7 SP1 ultimate edition, updated to the month of release. The aim is for you to be able to stick this DVD in, quickly get setup running, and then when setup finally stops your computer is ready to use. There are no steps in between, you don't need to do a thing, you get a fully unattended installation of everything. This means all your device drivers installed and no critical updates need installing. You just sit back and enjoy the ride. WinBorg XP was created by BartOfBorg. Further development since August 2006 by Soporific. 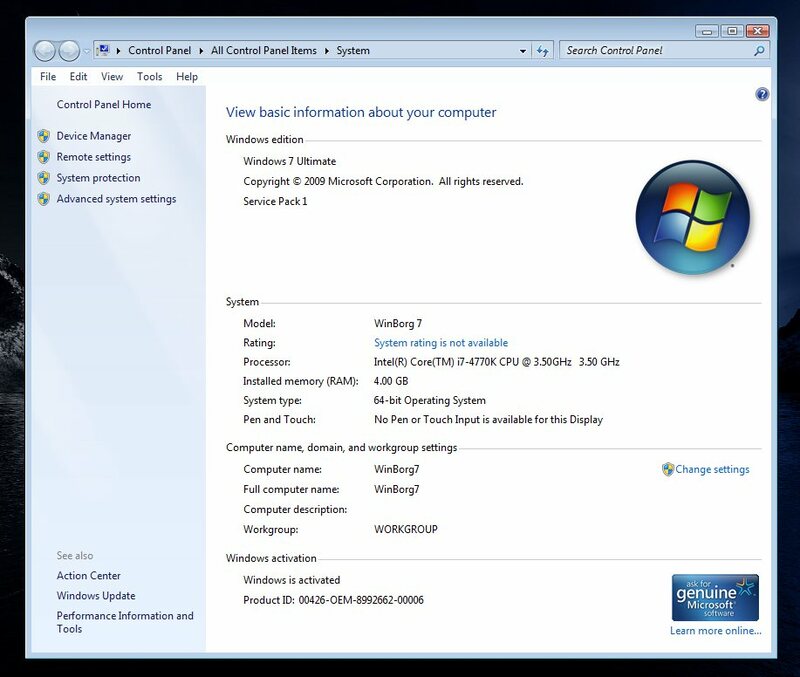 Your computer will boot into a PE, which is a stripped down version of Windows 7, where you can use a variety of tools to check your hardware or fix problems before running setup. 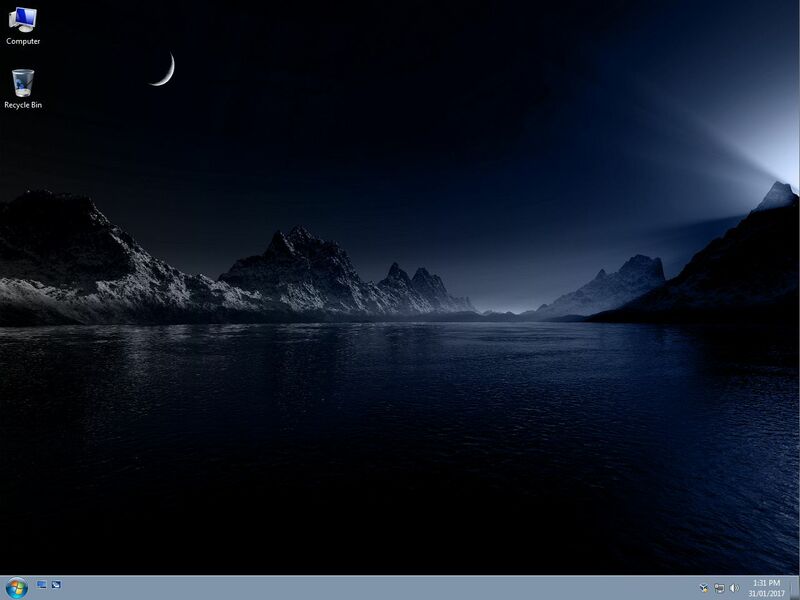 The operating system is Windows 7 Ultimate SP1. You should not need to download anything from Windows Update except maybe some drivers that Microsoft knows you need. You should also be able to 'validate' at any time with any OS you install from this DVD. When you visit Windows Update, you do not have to download or install anything in order to use it, the necessary files have already been integrated. * The Apps Library makes a triumphant return! - 64-bit apps: I have only included 64-bit versions of apps where it is at all possible there is a benefit from having access to more than 4GB of RAM. Any app that has a simple job to do does not fall into this category and so was not included. Lots of space was saved applying this philosophy. - I have ransacked the best theme libraries on the planet to present to you the top 40 themes to choose between. Available from the Apps Library. - FIXED: all apps small in size do not show the file copying dialog anymore, so no more flashing dialog boxes that only appeared for half a second. How annoying was that? Sorry for all previous versions where I did not apply this philosophy! I have also reduced the installer size and also added code to skip the install start and end messages when you use the Apps Library system. This saves lots and lots of time when you install many applications at once. * Microsoft Virtual PC was not installed like it was in previous versions. Only a tiny minority of the users of WinBorg 7 would want this pre-installed. * Lots of little cosmetic changes were made, WinBorg 7 is now a highly polished product. * Sorry about the post-install updates, I tried to integrate them into the source but it's not possible. Some of them have known reasons for why they can't be slipstreamed but there's no excuses for the rest Microsoft! Release Service Pack 2 for Windows 7 you cheap bastards! 1. Unpack the RAR archive file. You will need WinRAR v5 or 7-Zip v16 to do this. Earlier versions won't work. 2. Please read the .NFO file (use notepad or similar) as it contains information about the setup process that you should be aware of. In particular about the need to be online during setup to get all updates installed. It also contains instructions for using WinBorg 7. 3. If you want to proceed to making a USB version of WinBorg 7 but you don't have anyway to mount the ISO image, use WinCDEmu, mount the image and run DiscMenu.exe from the root folder. The option for USB install is in the menu. 1. Sigh. There is a problem with the apps library config file. There is a special character at the start of the CONFIG.JS file that is preventing the library from loading. See below for the fix. 1. Unpack the RAR archive. - this will add the WinBorg image to your filesystem so you can access it. 4. Replace the bad file with the fixed version. Instructions as to finding the file are included with the fix. 6. Look for the MakeDVD folder (in the new build) and use the utility inside it to remake the DVD. The other way to do it is to make the USB install and replace the bad file on your USB. It will save you remaking the DVD image. Another way to do it is use UltraISO, insert the new files, and re-save the image. It will still recognise the boot info. NEWS: I have released a cumulative update pack to fix 2 issues and update 2 apps, see the links below. The update pack includes the fixed and updated CONFIG.JS file so you don't need "WinBorg7.x64.January.2017.Fixed.Config-SOPORIFIC.rar" anymore. Issues fixed: The CONFIG.JS issue, and also the Networx installer had a problem. * If you use WinBorg a lot, please provide feedback about how you use it, and especially if you use it to customize for your own purposes. I made a great effort to make it as customizable as possible, but I'm sure I could do more! Also, please read the NFO file (use notepad or similar) before using WinBorg 7, there's lots of info you should know before installing, especially regarding Windows Updates and device drivers. Re: Driverpacks: -- i agree that it was a beautiful system with Winborg XP where all your drivers got installed but alas the driverpack guys haven't done squat since 2012. Not to worry, there are new solutions available! - if you are re-installing your OS, then use Driver Genius to backup all your drivers first. Then use it again to restore your drivers. The new version is out, see the first post but also note there is a fix for the Apps library config file --- one silly character is stopping the library from working. Arggg. It is easy enough to fix but annoying, so sorry! Excellent work Sop, can't wait to try it out! I'm confused about the 'fix' files. If I download the cumulative patch, I still have to do the extraction and rebuilding to get those fixes into the main image, right? Will you be releasing a corrected/updated image that includes these fixes? 1. Most people should be making a USB install unless you plan on burning to dual layer DVD. If you make a USB install, just replace the fixed files on the USB drive, no need to remake DVD image. 2. If you plan on re-making the DVD image, you need to follow all the steps I posted. 3. The cumulative pack is just an update pack. I called it that so it was clear you didn't need the first fix pack I released. 4. I won't be releasing an updated image because it is too large. It took a lot of effort to share 6.53 GB of project, so no. Ideally I'd like to but its just not reasonable. Finally home. Been very slowly downloading it and sharing it while I was away and simply tethering my computer via my phone at barely 3G speeds... but I'm home now and can spread it around pretty quickly! If you need a slot - hit me up. I see what you mean, the USB option makes things much simpler. Thanks! I've hit another snag. My download completed this evening, but when I try to extract or open the file with WinRAR, I get an error that the file is "either in unknown format or damaged". I tried 7Zip and got a similar error. Does this mean that the file is truly corrupt and I'll have to start all over again?! Has anyone been able to complete the download and confirm that the archive is good? I really don't want to download 6.5GB again if it's the source that's corrupt. Anyone know of a tool to repair RARs? 1. You will need WinRAR v5 or 7-Zip v16 in order to unpack the archive. Lots of people are still using the old versions. You can pack much more into RAR archives (especially large files) with version 5. I should have made this clear in the release post (I have now). 2. You can hash your copy of the archive to see if there is indeed a problem with your file. I have included 3 hashing values: CRC32, MD5, and SHA-1 at the bottom of the release post. If you don't have a good hashing program, google Hashtab and install it. Then, to use it, right-click the RAR archive and you will see a new "File Hashes" tab. It contains the hashing info. It is unlikely that this is the problem tho, because emule checks you have an exact copy of what I uploaded when it finalizes your download. I can confirm that the file is working 100%. I unpacked with WinRAR 5.01 and had NO problems. Thanks for the file Soporific, great work as always. I'll update now, thanks so much Sop! Can't wait to try this out. Thanks again for all your hard work. EDIT: Bingo, that worked! Awesome. Question: Rather than extracting, patching, and remaking the DVD image, is it possible to "plug in" the updated files to the image once it's mounted using something like UltraISO? It feels like I should be able to drag and drop the updated files into the proper places and just save the image. Will this break something in the installer? That's a good question, I will try that method out myself. Having said that, you are simply doing one less step with that method: you are cutting out the "copy files to a new folder" step. Everything else is the same. Fair enough if you don't have 10 Gigs of space space to play with but you have other probs if in that situation. Unfortunately, the "less than 10GB free" issue is exactly what I'm dealing with. I'm upgrading to a larger SSD, hence the need for your wonderful release! Also, I can't just drop it all to a USB drive, since my motherboard doesn't seem to want to boot from USB for some reason. It has the option in the BIOS, but refuses to recognize drives of any size or spec, so I'm stuck with a DVD9. Let me know if you determine if the ISO patch method will work. I plan to test it myself, but may be out of town for a couple days, so whoever gets to it first can report back. * Well, it appears that UltraISO v9.6.6.3300 can successfully remake a MS bootable ISO, but you'll need to go into options -> Save, and deselect "Backup Files on Save (.uibak) in order to prevent UltraISO from creating a backup. You don't have the space for it! * How can you live with less that 10 gigs of free space? I'm talking about all external HDDs as well.... go out and buy a 1 or 2 TB external HDD, they are cheap as chips! Glad to hear UltraISO can do it. I love that program. I got fed up with not having any drive space, so I bought a 6TB external and upgraded my primary OS drive to a 500GB SSD. I was finally able to get my Mobo to boot USB, so I used your suggestion of patching in the files that way, but it's nice to know it can be done in the image as well without unpacking and repacking if required. By the way, this release is the real deal, if anyone was wondering. The install went very smoothly, and the App Library (which I thought I didn't care about) saved me a ton of time on reinstalling all my various little utilities. Excellent work, Sop! Since the new version won't be out right away, I'm moving ahead with the install on my new rig using this version. When I boot to the USB drive I made (and used successfully a while back), it boots right into the PE as expected, but I have no "install" option. I suspect it's because I'm trying to install on brand new hardware (see specs below), but does anyone know a way to get it working? Trying to install from USB3 flash drive. I believe I build this image with extra USB drivers, but I can't recall for sure. maybe remove what will be your secondary drive. or maybe some drivers need to be installed first for hardware? or the drive needs formatting first. just throwin a few things out. Yes, It's driver-related, but I'm fuzzy on how to get those slipstreamed into the Winborg image. It appears that the NVMe drivers for my Samsung 960 M.2 drive are the biggest hurdle at the moment. I think the USB3 drivers are working, since my mouse and keyboard work in the setup screens, and everything I'm reading says those won't work if the drivers didn't load. So frustrating! It appears that M$ is leading the charge to get hardware mfgrs to drop support for older OS versions, so they can push Win10 and spy on us/sell our info. This is why I was really hoping the new version might be out with the Win8/10 PE, in hopes that perhaps it would sidestep some of these issues...oh well. I've figured out that the main issue seems to be lack of NVMe drivers for my M.2 drive. However, Winborg doesn't give me the option to launch the installer, where I'd be able to load the M.2 drivers, since no drives are found. How can I get it to either let me launch Windows setup manually or load the NVMe drivers during the loading of the PE? wouldn't they be installed before the os? from a seperate source? kinda like raid drivers? Well, not exactly. Normally, any extra drivers required to support storage devices not natively supported by the OS would be loaded during Windows setup using the F6/Load drivers screen. However, for some reason, if WinBorg doesn't detect a usable drive, it won't even enable the "install" option in the PE. 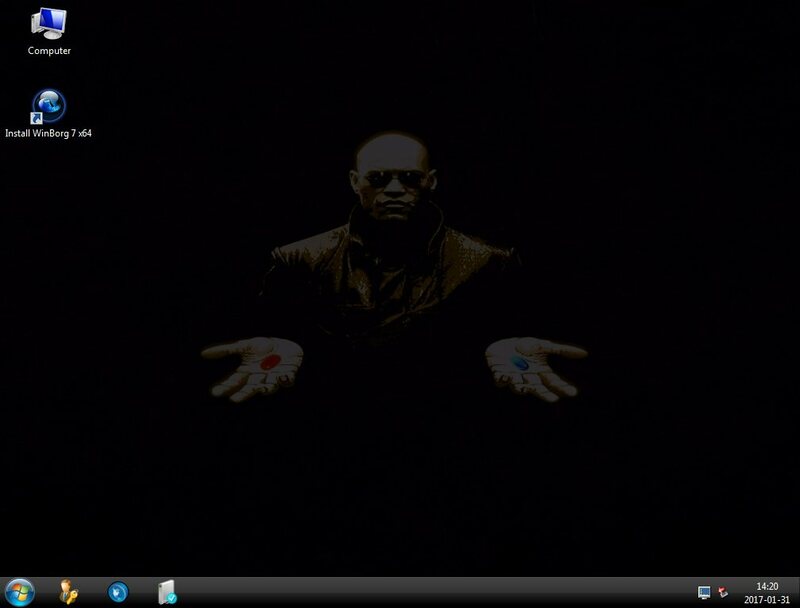 However, I got it to work via a convoluted combination of 2 separate USB drives, the motherboard support DVD, and a different version of Windows 7. I'm really hoping that the new version of Winborg is built on a different PE and therefore sorts out these types of issues. I think Sop indicated something of the sort, but I (most likely) could be wrong.